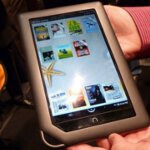 For the many people who decided on picking up the Barnes & Noble NOOK Color as opposed to the host of other dedicated Android tablets on the market, they’re in for one special treat that supremely unlocks a bevy of features to this sometimes regarded ebook reading device first and Android tablet later. Version 1.2.0 of the NOOK Color’s software specifically brings along Android 2.2 Froyo to the masses – meaning, you won’t have to go through some alternative ways to get it in line with some of its Android tablet brethren. Additionally, it features things like NOOK Apps, NOOK Email, an enhanced web experience, NOOK Kids Read and Play titles, enhanced NOOK Books, and much more. All in all, this software update is surely going to make this tablet even more favorable for people out there considering its low cost of ownership price tag. 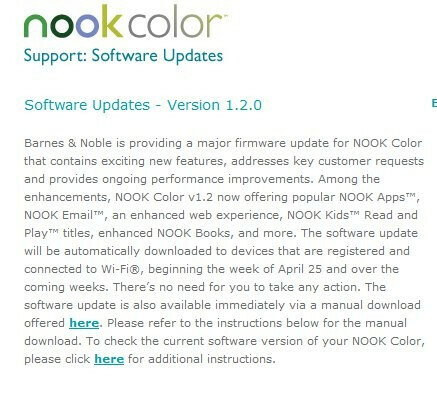 As it stands right now, owners should start to see the notification pop up on their devices indicated its arrival, but for those who are simply impatient, you can always manually do it yourself by heading to the Barnes & Noble NOOK Color support page. Well, I said I'd kill myself if the Nook ended up getting Froyo before the Fascinate. Looks like I lucked out by only a couple of days. Uh-oh. . . looks like a big chunk of that "ipad-like" market in North American just went to Android. FYI. . . people should realize that generally Windows tablets are not counted in the "tablet" category with the ipad because they "do more" they are counted as PCs. So, that market share is a bunch of BS anyways. why do u make me defend apple... BLAAAAAAH. i feel gross. MS PC tablets dont sell all that well compared to apple/google, so even if they were counted, Apple would still lead the pack. Now i need to go wash my fingers for typing a defence to apple! Actually they sell surprisingly well: touchscreen laptops are considered tablets, which would include devices like the Panasonic Toughbook, which is one of the go-to computers for law-enforcement, on-site-service technicians, and contractors, to name a few; do they sell in the numbers that ipads do? perhaps not, but there's still a significant chunk of sales there. I just got a NOOKcolor last Sunday and LOVE it and the price makes it a deal! It's smaller than an iPad but I prefer the size when holding it like a book. I surf the web on it, Facebook, Twitter, check email, etc.....and read ebooks. I've not touched the music player part of it yet.